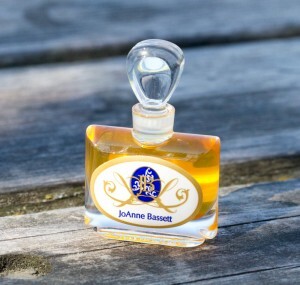 I'm a fan of JoAnne Bassett, who specializes in natural perfumes that are classically French in a way that you simply aren't going to get from France anymore. I really liked her Indulgence, and recently smelled and loved her Venus Amber. At that time, she gave me an envelope with samples of some of her other scents which I'll keep circling back to. Notes (according to the card): Clementine, Rose de Mai, Jasmine, Tuberose, Orange Blossom, Ambrette Seed, Amber accord, Tobacco, Vintage Mysore Sandalwood, Patchouli and others. Drooling yet? You should be. While reading that list you might think that it could go horribly wrong, and if it were coming from a lesser artist it might. But this is so well blended that there's not one note that's overdone in the slightest; the musky base and the patch are just seductive whispers under the innocent white flowers, creamy woods and hint of tobacco. Were I naming it I'd have called it "seduction". Lasting power is good for a botanical, I got a good six hours out of it. Since it really isn't an office scent (not that you couldn't wear it there, but I would think of it as an evening one) that's fine in my book. Sensual Embrace is available at JoAnne's website (link to Etsy site). Her Facebook Page is here. My sample was provided by the perfumer. The top notes hate me, but the bottom notes beckon. And I do prefer perfumes that are beautifully blended so that no one note sticks out. Two out of three ain't bad, right? A sample is in my future. Darn you. but I don't think you'll be disappointed.. The sad thing is that you can't really get them from France anymore with all the restrictions. Glad JoAnne is out there taking up the slack. Oh. Well. Yes, I need to try this.